Part of Midnight Sun Brewing Co.'s Alaska's Most Wanted Series, I picked up a couple of these bottles on my trip to Midnight Sun Brewing. My oldest brother insisted that this was one of the best Russian Imperial Stouts he'd and also that I get two. A (3/3): Completely opaque black beer with a lasting, creamy dark brown head. The head stays nice and foamy while drank, leaving behind a dark lacing. S (10/12): Incredibly complex aroma with lots of dark and roasty malts, hints of spicy rye, raisin and light smoke with a dash of molasses. Slightly alcoholic but this should be expected at the 11%. However, not a detraction at all. T (19/20): The aroma transitions nicely into this incredibly great and flavorful beer. 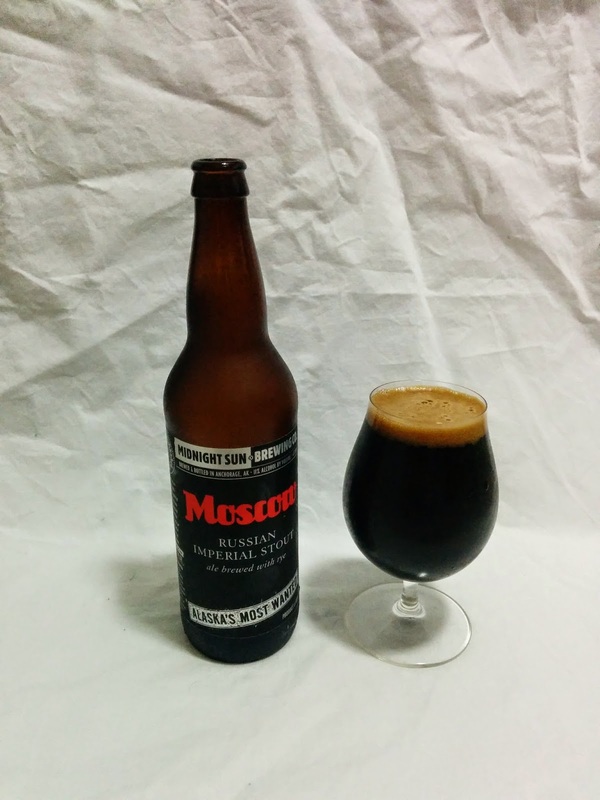 This is what a Russian imperial stout should taste like. Chocolate-y and roasted notes erupt and you take the first sip. The next drink gives loads of raisin and molasses with the spicy rye flavor that that was so present in the aroma. Simply fantastic! M (5/5): A full bodied beer with a silky, creamy and velvety smooth mouthfeel having a soft carbonation and a smooth lightly chalky finish. The alcohol is barely noticeable and almost nothing when considering the 11.0% ABV, as the beer warmed it because a little more noticeable but still not bad. I later found out that this beer can be purchased at Belmont Station as of last week. Go grab one before they are gone.